This is a small bird feeder that attaches to an outside window – now positioned in view of our kitchen table so we can watch the birds feeding while we eat. So far, visitors have included robins, squirrels and a small knitted pigeon (more of which later). Time to wrap up warm and go on an acorn-hunting expedition. 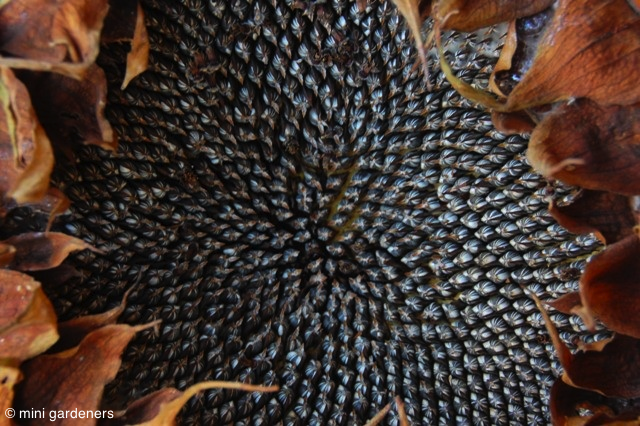 Back at home, plant your acorns as soon as possible – they’re prone to drying out which reduces their ability to grow. 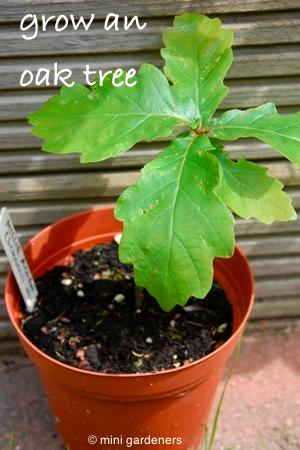 Try this simple trick to check if your acorns are likely to germinate and grow into oak trees. Plant your acorns in a pot filled with compost (or directly into the ground) just below the surface so they are about 2 to 3cm deep. Leave the pots outside over winter and protect from squirrels, who will think you have prepared a scrumptious winter snack just for them. Seedlings should appear next spring, fingers crossed! 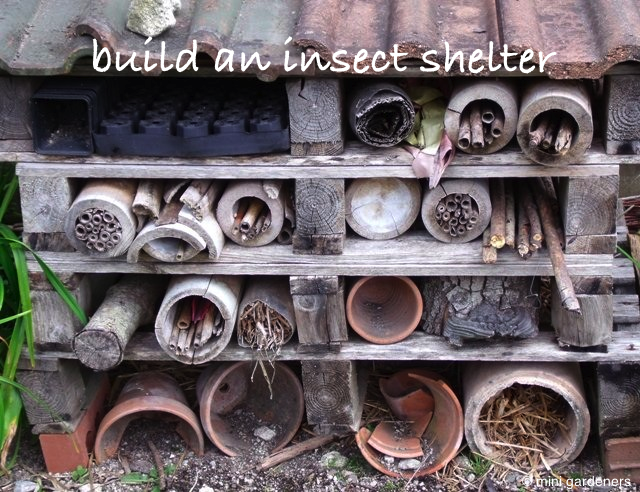 Many insects are good for the garden. For example ladybirds and lacewings eat greenflies while solitary bees are important for pollination. So give them a helping hand and build them a shelter for the winter. It doesn’t have to be as elaborate as the one above and you can make it from entirely recycled materials. The more nooks and crannies, the better. We’re loving these beautifully made kits from postcarden. 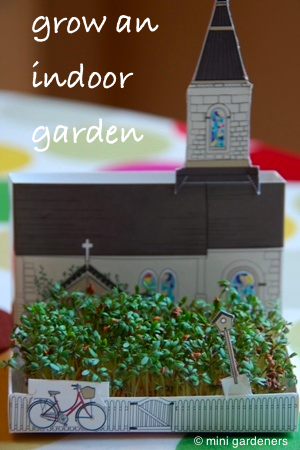 This one is the matchcarden village church and at less than £5 a kit, it’s tempting to buy a whole village. 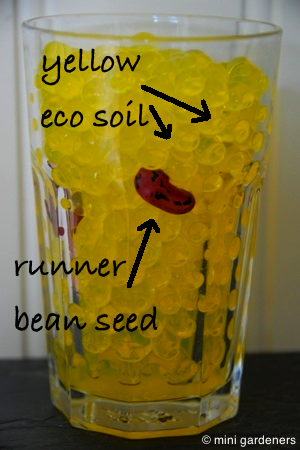 The kit comes with cress seeds which sprouted within 3 days. Probably about the speediest thing you can grow and great for short attention spans. The cress is destined for some egg and cress sandwiches and we’ll replant the church garden with some spare cress seeds we happen to have hanging around. 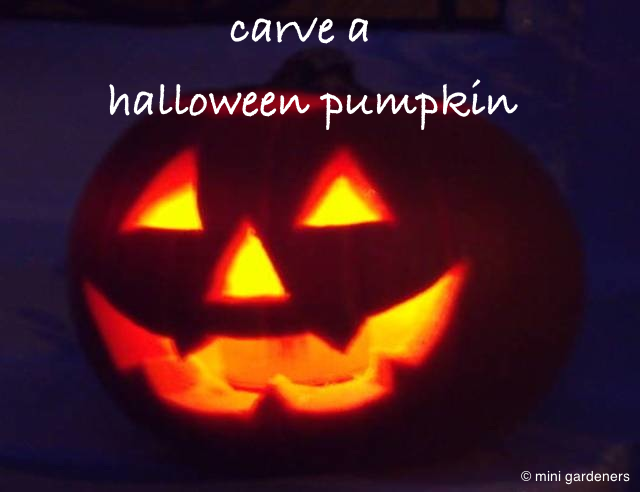 Must mention that wonky bird feeder to the vicar…..
..and resolve to grow your own pumkin next year. 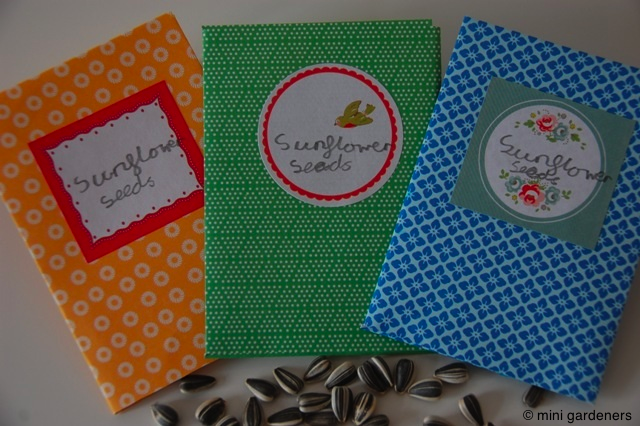 April is a good time to start sowing pumpkin seeds so make a diary note now if you’re one of those organised people who has already bought next year’s diary. It’s probably too late for daffodils but there’s still plenty of time to plant tulips. In fact you may be able to grab a bargain as bulbs are often reduced in price at this time of year to make way for Christmas stock. Plant tulip bulbs at any time up to the end of December. Plant in large pots with the pointed end facing up, deep enough so that two imaginary bulbs could sit on top, beneath the compost surface. Multi-purpose compost is fine. 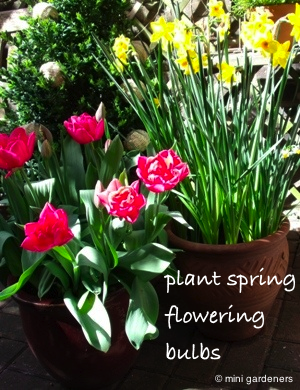 Bulbs in pots can be planted close together but try to make sure they’re not touching. One word of caution; drainage holes at the bottom of the pot are essential, otherwise the bulbs may rot. And finally, on a rainy day (there’s bound to be at least one) settle down with a hot chocolate and a learn to knit video from the internet. I had the challenge of teaching right and left-handed daughters to knit whilst barely being able to remember the basics myself, but it all worked out in the end. I’d recommend big knitting needles and chunky wool for beginners. 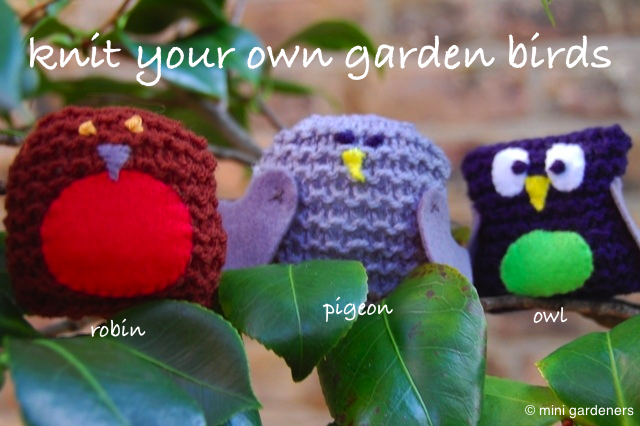 Once you’ve mastered casting-on, the knit stitch and casting-off, you’re experienced enough to knit your own garden birds. 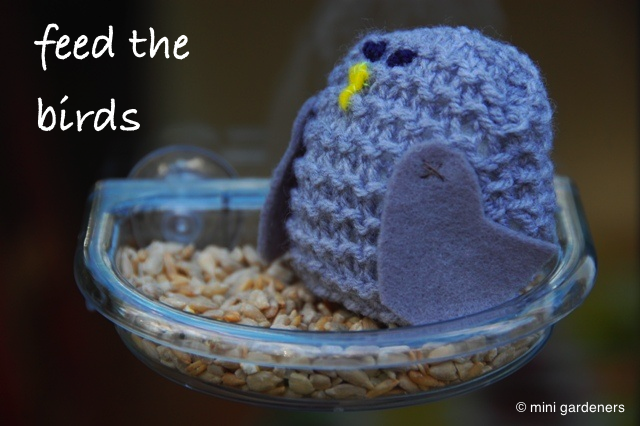 The flock above was based on a simple pattern by Buttonbag, an ideal project for beginners. We knitted 2 squares for each bird, sewed them together, stuffed, decorated with felt and then squished* into the correct shape. The RSPB site is a great resource for information about garden birds. * This is a technical knitting term although you won’t find it it many books. Categories: projects, trees, wildlife | Permalink.